The Answer To The Question : Is Alcohol Addictive ? The truth regarding alcohol is that it is certainly addictive. If the body is used to take in alcohol substances, the person tends to take greater than its required amount. Alcohol is composed of addictive substances that are considered to be fatal or poisonous for the human body. It is vital that every individual should be aware of what makes up alcohol to acquire knowledge about it. This will help them be aware of the consequences which alcohol can bring if it is being abused. Alcohol promotes psychological crutch where a person's stress, depression, and anxiety can be alleviated. People with many problems and heartaches tend to drink a lot of alcohol to forget a lot of burdens even for a while. For those who have a tough day at work, they consider alcohol drinking to relax the body that helps them feel better from the hard days of work. When a person consumes alcohol, dopamine is being released from the brain system which makes the person feel good. Alcohol also helps in the release of endorphins that is a natural painkiller. Whether the individual feels good under the influence of alcohol, it can lead to alcohol addiction. The nerve cells and the human brain will also be affected regarding receiving and processing of messages inside the brain. The mental procedure of an abuser will be impaired. This event will heighten the chances of a person to be dependent on alcohol and create tolerance to it. Alcohol dependency is a serious condition that only experts of alcohol treatment programs can be of great help in managing it effectively. According to experts, genetics are considered to be one component of alcohol addiction. If alcohol dependency runs in the family, there is a higher chance that a family member can become an alcoholic later on. Alcohol can also be addictive depending on the character and predisposition of a person. The environment for growth and development is one key factor of alcohol dependency. If the environment is conducive for alcoholism, then that family member will most likely develop the dependency on alcohol. With the help of the experts of alcohol rehabilitation centers, it will help build a society that's free from alcohol dependency. Through various programs, therapy and management of alcohol dependence can be done effectively. 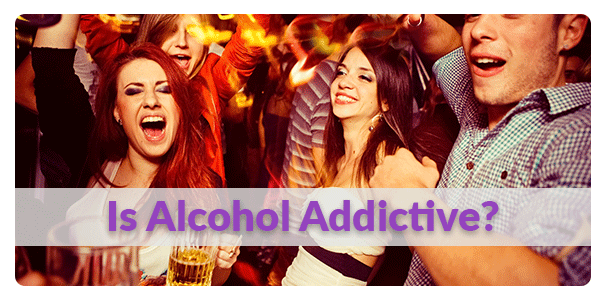 Alcohol can be addictive depending on the overall personality and environment the individual has. The influence of alcohol can never give benefits in a person's body as well as his or her life in the future. How to Stop Your Alcohol Addiction the Easy Way. Alcohol is an addictive substance. Unknowingly, most people don't know this reality until later on when they are totally hooked. You might mention that you only drink every weekend, but if you do this on a regular basis, you will soon find yourself consuming more and will become quite very often. So if you are still starting on your drinking career, better to abstain from drinking as much as possible. On the other hand, if you are already plagued by this addiction, it's time for you to decide to quit to save not only your life but your loved ones as well. Deciding to quit drinking is the first step that is to be taken to make things easy for you. You have to strengthen your desire to stop until it becomes an obsession. Once you have attained this level of thinking, you will do everything in your power to stop your addiction to alcohol. So how do you strengthen your desire you might ask? First, you have to change the way to think about drinking. If you firmly believe that drinking is giving you all sorts of beautiful emotional feelings, then you have to change this false belief. You have to admit to yourself first that alcohol is doing nothing to help improve your life. And you have to realize that you are consuming an addictive substance and you have to accept that you are addicted to it. Accepting this reality may be difficult at first. You can read books about quitting, join groups or organization, visit blogs and websites, start talking to successful quitters or even talking to your loved ones and seek their support. There are many ways to help you admit the truth, and once you have done this, then you are more than half-way to freedom. "Alcoholism is a menace to the society" as they often say. It is a disease but a curable one. I know many recovering alcoholics are now living a life of peace and harmony. They have gotten their life back and their social respect in our society. Don't waste the remaining significant years in your life. Seek help whenever you can to stop your addiction. Be confident that you will be able to conquer this addiction. No one can force you to drink the next shot except yourself. You have no other for except yourself so focus on strengthening your desire to quit as mentioned above. Believe that you can so start quitting your addiction today. Alcoholism will ruin your life. You must learn how to quit drinking at all cost. The sooner you quit, the better are your chances in dealing with alcohol withdrawal symptoms.